Chito Miranda's latest post on GF Neri Naig in his Facebook account. She's an actress. Though she is not as sikat as the others, she is happy and content. 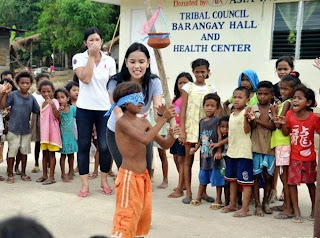 Not many people know this, but whenever she has time to spare, she'd go and visit her favorite aeta village along with her friends, and hang out with the aetas, simply because she enjoys it. She'd collect and bring used, worn-out school books and read to the kids, trying to help them learn to read as well. She'd bring school supplies na binili sa divisoria, sit down with the kids, and teach them how to write their names. She'd bring snacks, and sometimes would even set up games for the kids in the community.